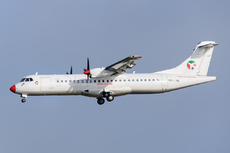 Danish Air Transport flight DX31, an ATR 72-202, took off from Bornholm-Rønne Airport, Denmark at 06:10 hours local time. One minute after take-off, the crew sensed smoke in the cockpit. The smoke intensity increased and the crew received a low oil pressure warning on engine no.1 (left) in combination with a torque loss of 30%. The cockpit crew donned their oxygen masks and shut down the engine. The crew declared an emergency to ATC due to smoke in cockpit and cabin, and requested an immediate return. The ATCO cleared them for a direct landing and after another four minutes the aircraft landed on runway 11, stopped on the runway and evacuated all 14 passengers and the crew without any injuries. There was no controllability problems or other technical issues with the aircraft. nor recurrent cabin crew PBE training requirements. the left hand seated pilot. A subsequent test of the interphone/PA system did not reveal any faults. 1. Engine no. 1 seized approximately one minute after take-off, most likely due to the failure of the bearing no. 2. 2. The CA 1 was unable to open her PBE protective bag.